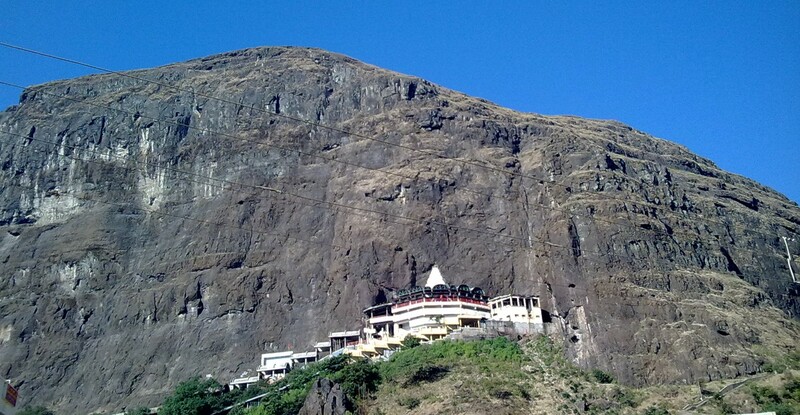 The Saptashrungi gad is located in the East-West range of Shyadri mountains, approximately 65 km from Nashik. It is one of the most visited religious sites for pilgrims coming from neighbouring states like Karnataka, Andhra Pradesh, and Gujarat. Chaitrostav and Navratostav are two occasions in the year when the devotees throng to this place in large numbers (5-600,000 people on each occasion) for worship. Approximately 3000 pilgrims pay their tributes to this holy place daily. As the temple is situated high in the mountains, the Public Works Department of Maharashtra proposed a cable-car to take the devotees from the base of the mountain to the temple. However examining the site, it was identified that the temple and the area of the proposed cable car station in front of the cliff could be affected by rockfall from the cliffs above. It was therefore necessary to protect the temple from the risks of rockfall. The height of the rock face above the temple is around 200m and it displays heavily jointed loose rock masses at the top of the cliff. Furthermore, multiple vertical open joints in the rock mass on the vertical slope above and around the temple were a hazard and would have to be addressed prior to construction of the cable car station, as even a small portion of rock falling from such a height was a threat to the station and could lead to fatal accidents. Hazard mitigation and rockfall protection works would be required above and around the proposed station area. Various protection measures were considered, including rock anchoring, grouting, mesh reinforced shotcrete and a protection wall alongside the track to safeguard against rolling stones. Also the station itself was considered with the upper station roof designed to accommodate rock impacts. 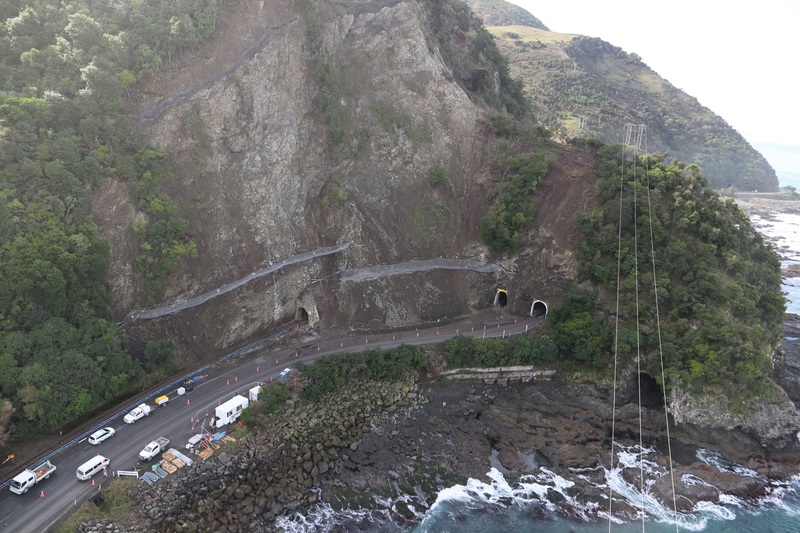 A combination of rock slope stabilisation meshes and dynamic rockfall barriers was finally determined as being the most effective and efficient solution, out of all the options considered. Research and design analysis, including using the MacRO rock slope surface stabilisation software, were carried out to understand the potential loads exerted by rock debris accumulation within the mesh. Maccaferri’s HEA Panels were selected to provide the surface stabilisation function, in conjunction with rock bolting. HEA Panels are ultra-high strength, low strain steel cable mesh panels, and feature a patented double- knot at every node where the steel cables cross. This gives the panel its high resistance to punching loads with minimal deflection. As the HEA Panels have a large aperture (300-400mm square depending on selection), smaller fragments of rock detaching from the slope could still be dangerous as they could pass through these apertures. Accordingly, the HEA Panels were installed in conjunction with double twisted steel wire mesh which has a smaller mesh aperture, capable of containing these smaller fragments. The use of rockfall software was also used to analyze the appropriate position, height and energy absorption capacity of a rock fall barrier. This barrier would arrest rocks falling from the rock slope towards the cable car station. Maccaferri’s dynamic rockfall barriers are available with energy absorption capacities ranging from 100kJ to a world-leading 8,600kJ. Tested and Certified in accordance with ETAG 027, the barriers provide reliable, cost effective protection from falling rocks.